boblovesmusic: MOTD - The Stand: Congrats Grads! So it's graduation season! A number of my friends have walked down aisles and received their diplomas that say "good job you completed college/grad school/high school! Yay!" So in honor of that, here's a little ditty about graduation day! 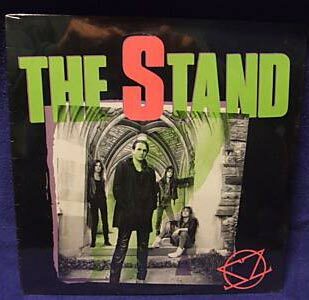 Not too much to say about this little gem of a band, hailing from Nashville, Tennessee, The Stand was playing a proggy-powerish style of metal back in the late 80s. Taking a prog songwriting influence from Rush, mixing it with the infectious bounce and crunch of 80s melodic metal, The Stand had a knack at writing some damn catchy heavy metal tunes. This song takes a relaxed and chill, mid tempo, introspective direction while still having a metal punch. The vocalist takes the stand (heh) out the most with this weird slur thing he uses in the bridge and chorus. From what I can pick out of the lyrics, it is a sorta celebration of graduation day (at least I hope), something about how you're no longer pending to the ways of the professors/teachers haha. Either way, I think I would prefer to have this song played at prom over the Vitamin C song hehe (ok I have soft spot for that one too). Anyways congrats grads! Good luck on your many endeavors! Check out the song too!